Chairs, tables and linens–linens are not a separate fee on top of the rental fee. Do you charge extra for specialty linens and do I get to pick what colors I want? We do not charge extra for specialty linens and you get to choose whatever color you want. Do you charge more for Peak Seasons? How much do you charge for extra time? YES!!! We are one of the few venues that allows you to bring in your own alcohol. When you leave, you take what is left over. There is not a restriction on time or when you can drink. We do not charge a corkage fee. You and your guest will drink out of elegant glassware not plastic airplane cups. Other venues charge up to $40.00 pp and up $400.00 per bartender. They also add a 22% service charge and 6% sales tax on top of those fees. Do you charge extra for your Wedding Coordinator? No, we provide a wedding coordinator at no extra charge with the ceremony package. 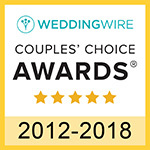 They will meet with you 30 days prior to your wedding for 2 hours and go over all your specific details.They will be there during the rehearsal to walk you through any last-minute concerns and will be at your disposal the day of your wedding. Are we required to use your Caterer? No!! 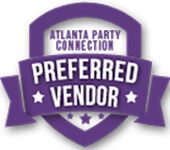 We are one of the few venues that do not require you to use our Preferred Caterers, DJ, or Wedding cake vendor. 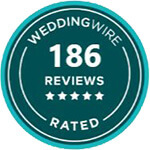 If you have a moment, please read one of over 180-5 star reviews on Wedding Wire or Google. 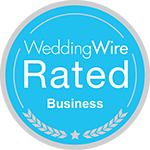 Our previous clients will tell you how accommodating, flexible and affordable our venue was for them and can be for you.